Keywords Is Being Sunsetted in 2018. Here's Why. When you think about the keywords report in HubSpot, you have likely used it to help decide what to write about, and how your existing content is performing. But today, search is about much more than just keywords. As marketing continues to evolve the rise of machine learning, artificial intelligence, and conversational search mean that the same keyword-centric formula we used years ago no longer works. As a result, the way we decide what content to create and how to measure it needs to evolve. In this post we'll talk about the way to adapt using the content strategy tool and why we're sunsetting the keywords tool. But first, let's cover how search has changed. Search has evolved drastically over the past 10-years, but the way we create content has only slightly shifted. Longer and more conversational voice queries have become the new norm. Back in 2006 it would have been ordinary for you to search for "Restaurants Boston" whereas today the same search would sound more like "Where are the best places to eat near me right now?" The differences between those queries cannot be understated. The second relies on the understanding that Google will pick up the intent of your search and serve relevant results. Because of the improvements of Hummingbird and RankBrain, Google has a good understanding of the intent of your search. For example, here are two very similar searches with vastly different intent, and much different results. 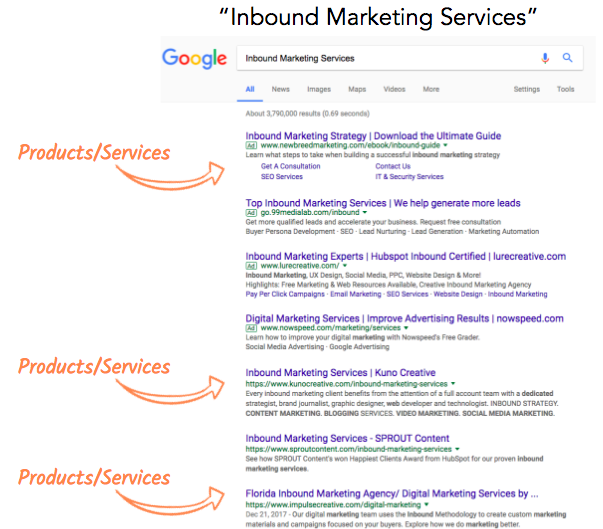 For the most part all of the results for the search above are educational and designed to help teach the searcher about the differences between inbound and outbound marketing, definitions, and examples. But if you just add "services" to the end of that query, your results transform and are filled with companies that offer services who can help you run inbound marketing campaigns. The average #1 ranking page will also rank well for about 1,000 other relevant keywords. This highlights the value that creating topic-based content can provide. Solely focusing on keywords will ultimately be time consuming and likely still won't yield the same results. While we can all agree search has changed, and topics are crucially important, we are not saying that keywords are irrelevant. In fact, the concept of keywords is still very important to your SEO and overall content strategy. Once you answer the question, what do you want to be known for? then you should still perform keyword research to determine the content within that cluster. 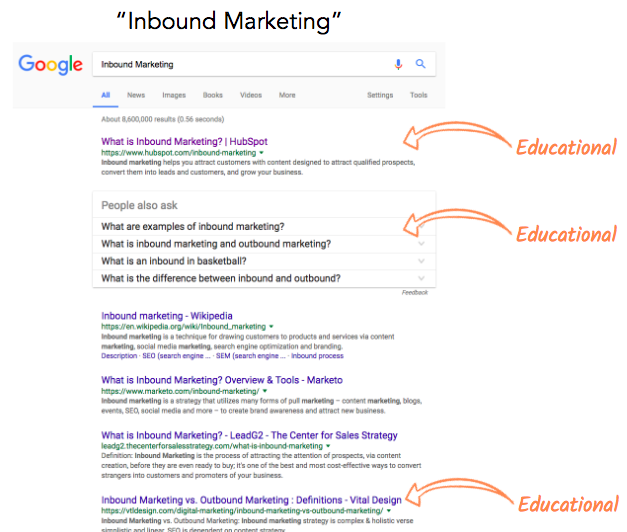 For example, if you're creating a pillar page on "Inbound Marketing," then Google SERPs tell you the page should contain information about the differences between outbound vs. inbound marketing, examples, content marketing, SEO, and more. These are clear from some simple searches and deeper keyword research. The distinction here is that an overall topic should be decided based on areas of expertise (or desired areas) for your business, and ideally high search volume. If you're looking for an easy way to perform some competitive keyword research, GrowthBot, a free marketing and sales chatbot that you can have a conversation with in Facebook Messenger, or Slack, can easily tell you keywords that domains rank for. For example, I asked which keywords Buffer.com ranks for in Messenger, and GrowthBot responded with a list below. Rank and difficulty score may still be staples of how you create and measure content. Let's dive-in to each. Using rank, or difficulty, as a way to judge which content to create means that you are solely focused on the potential low-hanging fruit and not going after opportunities to own a topic in search. Studies have shown there is 0% consistency in rank. As a result, keyword difficulty can vary wildly. This strategy is akin to solely following your competitors instead of charting your own course. Start by asking yourself what do I want my business to be known for? Depending on the answer you have a topic already, and you can begin to chart your own course. Next, let's talk about measurement. Many marketers today still measure their success, or failure, based on an arbitrary metric known as rank. Put simply, we feel good when we "rank #1" and it gives us a clear action item when we don't. The problem is, rank is a proxy for success and by itself doesn't move the needle for your business. If you rank #1 for a query that hardly has any search volume and ultimately doesn't generate leads or customers, then does the ranking still matter? 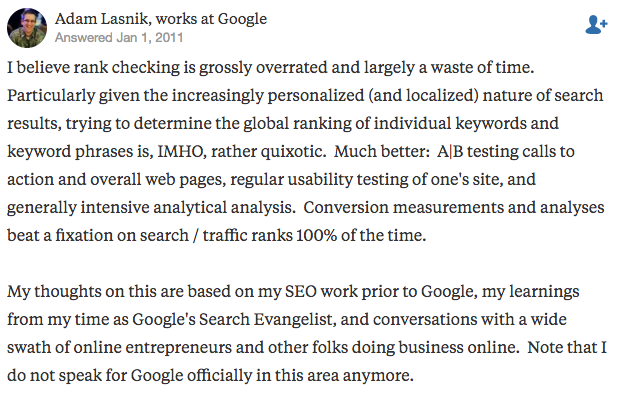 This image is important because even 7 years ago Google was directly telling us we shouldn't focus on rank. So, why in 2018 are we still focused on a metric that ultimately doesn't define our success? My recommendation is that you should refocus on the sessions, leads, and customers your content is generating -- which HubSpot's content strategy tool is uniquely set up to do. Based on the above, I hope you now have a good understanding of how search has changed away from keywords towards user intent, and from proxy metrics to actual success metrics. Because these are all capabilities of the new content strategy tool in HubSpot, we have decided to sunset the keywords report as of May 30, 2018. The keywords report ultimately updated once-a-week based on exact match for a single locale. Not only that, you may have noticed at times the keywords report struggled to get any data at all and was unreliable for days at a time. We found this was a situation that isn't improving with the state of rank tracking across the industry. In full transparency, many content marketers and technical SEO professionals have been utilizing dedicated tools like SEMRush to get this data. If you need rank or specific keyword information, we recommend exploring one of these tools. We strongly believe the future of content and SEO is rooted in user intent and providing searchers with the best content that answers all their questions. This is why we built the new content strategy tool, and why customers like Townsend Security, and IDS Agency are seeing remarkable success. If you have questions about the keywords tool, content strategy, or just want to talk through this change visit us on the HubSpot Community where we are open to discussing this further. For more information on how to create content that is optimized for search, and visitors in 2018, read this post on how to create effective content using content strategy.